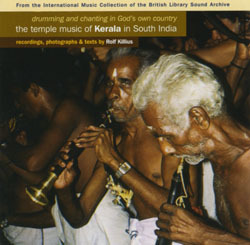 Cut off from the rest of the Indian mainland by the expansive Western Ghats mountain range, and open to the influences of the Arabian Sea via its 1000km coastline, the culture of the tiny Indian state of Kerala in the very south west of the country, is quite different from that of the rest of the Indian subcontinent. In addition to the friendly people and the endless green of the countryside dotted with coconut trees, Kerala impresses through its man-made soundscape, largely centred around the ubiquitous Hindu temples. Derived from ancient forms and supplemented with performance and visual arts, brightened with elephant processions, special pujas (worshipping forms) and fancy shops, these events form the main leisure time attraction of the Hindu population. The recordings on this CD, made in and around these between 1995 and 1997, demonstrate the vast range of performance genres. The huge percussion orchestra performances, the ancient styles of devotional singing, and the small music ensembles featuring rare traditional instruments like the huge C-shaped horn, the kombu, are some of these electrifying styles.